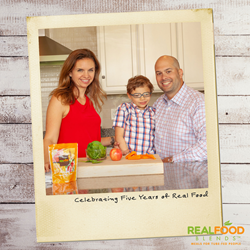 Real Food Blends, makers of 100% real food meals for people with feeding tubes, and the company that started a real food revolution in the medical community, is celebrating its 5th anniversary. In honor of this milestone, the company is launching a week-long celebration that will highlight special moments from over the years and feature daily giveaways. March 18-22, 2019 Real Food Blends will host daily giveaways for its customers in appreciation of their enthusiastic support. Each giveaway will feature a prize pack that includes different tube feeding items, including Real Food Blends meals and other products that help make life with a feeding tube just a little easier. Different company milestones will also be highlighted across the company’s social media accounts each day. The week-long celebration will conclude with one lucky person winning a grand prize pack that includes a Vitamix blender, a $500 Visa gift card, five Variety 12-Packs of Real Food Blends meals and more. “Five years ago, we started with three different meal varieties and sold out of our first production run of 15,000 meals in just a few weeks. Today, we’ve sold millions of meals and have six different meal varieties to offer even more nutritional variety for people with feeding tubes. We’ve heard from our customers since the beginning about what a difference a wide variety of real food has made in their lives and they’ve been endlessly supportive of our meals and company. Everything we've accomplished over this past five years wouldn’t have happened without them and we’re thrilled to give back to our customers as part of our 5th anniversary celebration,” said Tony Bombacino, Co-Founder, President of Real Food Blends. Real Food Blends makes 100% real food meals for people with feeding tubes. Born from Julie & Tony Bombacino’s love for their own tube-fed son and a belief that we all deserve real food and nutritional variety, the meals are free of corn syrup and preservatives, are shelf-stable and covered by many insurance plans. With millions of meals sold, they are available nationwide through DMEs, medical supply and home infusion companies or direct via RealFoodBlends.com and Amazon.com.